I'm ready to proclaim Fleur de Lotus the best Chanel color collection in years. That's a bold statement, but I think it's warranted. As you know, the collection was an Asia exclusive, but it was made available to us in the United States for Nordstrom's Anniversary sale. My first ho-hum reaction was tempered by time. When I received the collection and started wearing the pieces, serious love set in. I've featured the gorgeous blush and the icy green Illusion D'Ombre in Rivière, two knock-your-socks-off pieces from Fleur de Lotus (just scroll down). Today, I'll focus on the eyes. 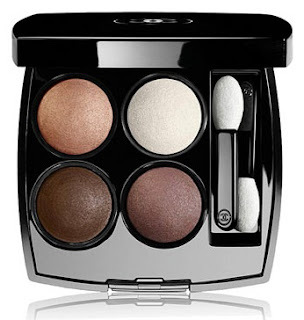 Chanel's Les 4 Ombres Rives Eyeshadow Palette ($58) is exquisite. What neutral shadow lover wouldn't want it? When mine, which I ordered online, arrived from Nordstrom, I quickly photographed it in its unused state and then started to play. I immediately discovered that the shade at top left is nearly rose gold. Anyone who has been reading Best Things in Beauty knows that rose gold is a color that makes me deliriously happy. And so it was with Rives. From classic ivory to rich brown, the shades of the essential eyeshadow compact offer unlimited looks of elegance. The smudge-proof, dermatologist-tested formula can be applied dry for subtle shading or dampened for more intense color, with long-wearing results even in extreme climates. Chanel's understated description doesn't do justice to this beauty. The colors are beautiful in the palette. They are even more beautiful on the skin. I took many swatch photos in full sun, and every one of them was good. I had applied the shadows with a sponge-tipped applicator, and I swatched clockwise, starting at the top left. What would you call the stunning shade at the top of my arm? It's gleaming rose gold to my eye, but I could also call it pastel copper, a peach-gold hybrid, and many other flattering terms. No matter what words characterize it, on my eyelids it's drop-dead gorgeous. Dear Chanel, could I please have a vat of it? The ivory - or white - shade is a nice one. It adheres to my skin perfectly (as do all the shades), leaving a nice white base or highlight. The taupe will delight any taupe lover. While I applied it heavily for the swatch photos, it's fabulous when applied normally with a brush. The dark brown is a good shade for me. It's a cool brown - my favorite. All of these shades are complementary, giving us many options for mixing and matching or layering. Chanel hit it out of the park with Rives. Did you purchase it? Do you like it? I'm crazy about it. Right now, I'm trying to restrain myself from ordering a second one. I just paid my AmEx bill, and I still want to go for broke with the Fleur de Lotus Collection. As you know, you can find it at Nordstrom - only. It's available online and in-store. Didn't I tell you? haha. 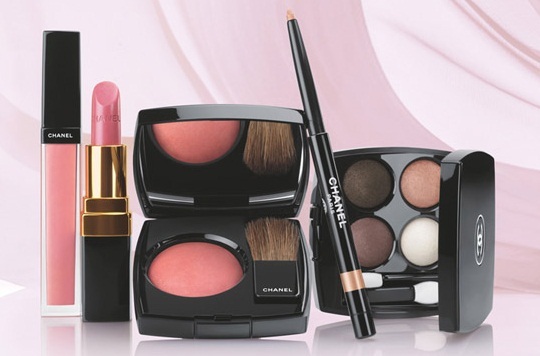 It is the most beautiful CHANEL eye quad ever. Ever. (BTW, the Chanel Riviere that I spotted online last night disappeared as quickly as it reappeared). It bears about as much resemblance to Kaska Beige as a turtle does to a jack rabbit. Katie, very different, I think from Kaska Beige. Get this! Better than Savannah Beige, I think. I love this eye quad a lot, but I have to pass on this one because I already have a lot of neutrals in my collection. I'm so happy I bought this. I love it and I didnt think I would love it so much. I've been wearing it everyday. I always love the Asia exclusives the most. Wish they would make them available in the US at all Chanel counters. This set is the first thing I bought for the Nordstrom sale - love it! Ah, to have the money to buy every Chanel product that exists! This looks very pretty, but I think I have enough Chanel eyeshadows for now. Must save for Chanel Holiday. I really can't wait for that. WOW, this palette is gorgeous. I hope you're going to swatch the pink lipstick I see in the collection. It looks gorgeous as well. I have to ask your opinion. If you had the choice of purchasing either the Dior Khaki Palette, which I was initially attracted to and still feel a propensity toward, and the Savannah 747 (I think), which one would you choose? I wish I could get both but I have to choose only one. I'm leaning toward the Khaki but what do you think, given we have very similar skin tone. One more thing, will you be doing any swatching on the Fall Shu Uemura Palettes as well as the Fall Chantecaille collection? That elephant palette looks gorgeous as does the blush. But so does the gel bronze eyeliner and the safari lipsticks and lipglosses. OK, well I suppose that's pretty much the whole collection. I had to have a lot of willpower not to purchase the Dior Limited Edition 3 color Nordstrom's Palette in Purple, as well as the accompanying Dior Nordstrom's Dark Pink Lipgloss and the Dior Plum mascara so I could save for the Chantecaille collection. Hope you and your mom are doing well. You're always in my thoughts. Sorry (and surprised) to hear that Anonymous! Did you get it Stacie? Today, at my local Nordies, they were gone! Entirely SO. The dufus SA didn't even volunteer to order it online, which you can still do. Yep, Carol, I sure understand. You are too good, Rosemary. I may have to sell antique silver by then, but I'll keep spending on the great intros. Yes to Chantecaille, no to Shu Uemura. I didn't buy the Chanel lip color. That formula isn't my fave. You need the Khaki from Dior. It will be striking on you. SO tempted to get this and the fleur de lotus blush and I have been looking at the illusion d'ombre in Emerveille too, all new Chanel products to me. I only have lip and nail products at the moment. I do have a birthday coming up so maybe this can be a treat to myself. Do you think any of the above would look good on someone with hispanic coloring?